Humans are a puzzling species. On the one hand, we struggle to survive on our own in the wild, often failing to overcome even basic challenges, like obtaining food, building shelters, or avoiding predators. On the other hand, human groups have produced ingenious technologies, sophisticated languages, and complex institutions that have permitted us to successfully expand into a vast range of diverse environments. What has enabled us to dominate the globe, more than any other species, while remaining virtually helpless as lone individuals? This book shows that the secret of our success lies not in our innate intelligence, but in our collective brains–on the ability of human groups to socially interconnect and learn from one another over generations. Drawing insights from lost European explorers, clever chimpanzees, mobile hunter-gatherers, neuroscientific findings, ancient bones, and the human genome, Joseph Henrich demonstrates how our collective brains have propelled our species' genetic evolution and shaped our biology. Our early capacities for learning from others produced many cultural innovations, such as fire, cooking, water containers, plant knowledge, and projectile weapons, which in turn drove the expansion of our brains and altered our physiology, anatomy, and psychology in crucial ways. Later on, some collective brains generated and recombined powerful concepts, such as the lever, wheel, screw, and writing, while also creating the institutions that continue to alter our motivations and perceptions. Henrich shows how our genetics and biology are inextricably interwoven with cultural evolution, and how culture-gene interactions launched our species on an extraordinary evolutionary trajectory. 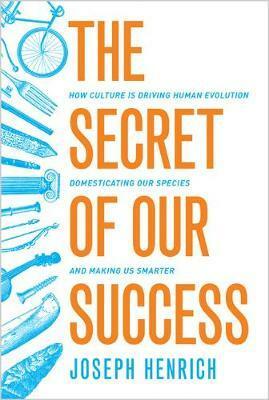 Tracking clues from our ancient past to the present, The Secret of Our Success explores how the evolution of both our cultural and social natures produce a collective intelligence that explains both our species' immense success and the origins of human uniqueness.